Fathom Arms has been generous and are offering an exclusive coupon code for their Nitride Full Auto Enhanced Bolt Carrier Group (E-BCG). 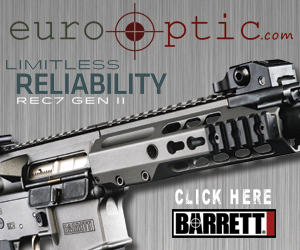 The E-BCG retails for $174.95 and with the $20.00 off coupon code brings it down to $154.95. Though there is no Coupon Code for the Stripped Fathom Arms Upper Receivers, they are currently on sale for $84.95. For more information on Fathom Arms, visit: http://www.fathomarms.com/. Check out this extreme torture test of the Faxon Firearms ARAK-21. LanTac USA, who has been mostly known for their Dragon Muzzle Brakes, had a booth full of new awesomeness available for all to see….and for one sticky fingered thief, a BCG to take home. LanTac USA’s Blast Mitigation Device, or BMD, is a removable shroud of sorts that can be placed over the Dragon Muzzle Brake to control the side blast from the Dragon and away from the shooter. The BMD is quickly removed from the Dragon by pressing two release buttons on either side of the device. This Enhanced BCG is the brother of the Ti Enhanced BCG that was stolen from the LanTac booth at SHOT. The stolen version was a one-off version without Forward Assist serrations and was made of Titanium. Click HERE for more info from LanTac regarding a description of the stolen BCG. They are offering a reward. The Enhanced BCG is M16 Full Auto style, machined from 8620 steel with a Shot Peened (SP) bolt and is Magnetically Particle Inspected (MPI). The entire carrier assembly is NiB, electroless NiB coated with the patented advanced UTC EXO process. The carrier features forward gas porting with enlarged gas vents to run cooler and cleaner and reduces the pressurization of the receiver. The LanTac Gas Block will fit .750″ diameter gas pad barrels and uses two set screws to secure the block in place. The LanTac USA SPADA-S Rail is a lightweight freefloat handguard that features reinforced attachment positions at the 3, 6 and 9-o’clock positions with helicoil inserts. The rail offers zero protrusion to the rear and will mount to any upper receiver, regardless of shape. The LanTac USA Upper Advanced Receiver, aka UAR, is machined from Billet 7075-T6 aluminum, is finished with MilSpec, Type 3, Class2, Deep Black, Hardcoat Anodizing and comes standard with M4 feedramps. The UAR comes standard with a CP-R360 Domed Head Cam Pin. The Cam Pin features a circular head with singular flat face so it can retrofit any other BCG cam pin without the need of removing the gas key. For more information on LanTac USA, visit http://www.lantac-usa.com/. NSZ85 does a great job in reviewing the Faxon Firearms ARAK-21 Upper Receiver and how to break it down in this video. I am still amazed in how quickly and efficiently you can swap out the 5.56mm barrel for a 300BLK barrel. AR and AK…the best of both worlds. Aero Precision has introduced several new products for 2014. Building off of their successful COP (Continuous Optics Platform) monolithic upper receiver, Aero Precision is now offering a gas piston compatible COP Upper for the AR-15 in carbine and mid-lengths and are in the process of working with Adams Arms to offer a package including the COP and the piston kit. Also available later in 2014 will be a COP Upper in .308. For more information visit, aeroprecisionusa.com.